Frank Abagnale. PHOTO: Cybercrime Magazine. While he’s not a fan of it, the iconic ex-con-artist and long-time FBI consultant believes all users will be authenticated by their smartphones. Frank Abagnale is one of the world’s most respected authorities on forgery, embezzlement, and secure documents. His riveting story provided the inspiration for Steven Spielberg’s 2002 film, Catch Me If You Can, starring Leonardo DiCaprio as Abagnale and Tom Hanks as the FBI agent fast on his heels. Our Deputy Editor, Georgia Reid, sat down with Abagnale at the New York Institute of Technology (NYIT) Manhattan campus on October 11, 2018, for an intimate discussion on cybercrime, hackers and data breaches, and much more. The way Abagnale sees it, cryptocurrency is a hoax, but blockchain is the secure digital platform of the future. Watch the entire video interview below to hear why. CM: I wanted to give some background to our listeners about what you do today. I know you’re currently a lecturer and consultant at FBI. Tell me more. FA: Many people just know me from the movie, “Catch Me If You Can,” but I’ve been at the FBI for 42 years. I teach at the FBI academy. I spend a lot of time with our agents in the field. And I spend a lot of time on cyber-related incidents and things of that nature. CM: What is the biggest issue we have right now in cybersecurity that you talk about with the FBI? FA: Well, first of all, we know that every breach that has occurred so far going back to TJ MAXX occurred because someone in that company did something they were not supposed to do, or because somebody in that company failed to do something they were supposed to do. I believe that hackers don’t cause breaches, people do. And so consequently they leave a lot of open doors, and that just leaves a place for the hacker to go. We do a very poor job of training and educating people in business on how to protect their company and their assets and information, and we are leaving a lot of places open for hackers to get in. People who steal mass data warehouse that information for three to four years. If I steal your name, Social Security number, and your date of birth, the longer a hacker holds that the more valuable it gets. 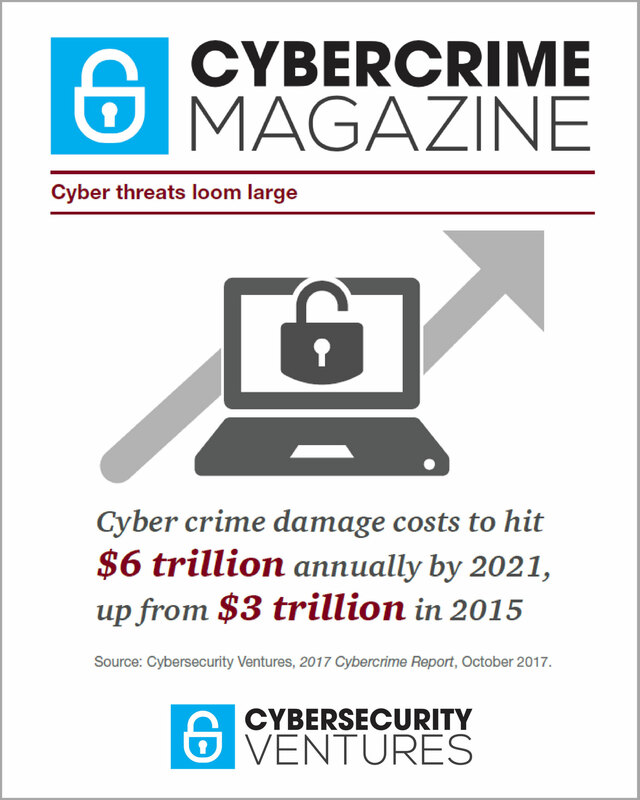 CM: Frank, you’ve been quoted saying that cybersecurity damages will cost the world $6 trillion by the year 2021 — that’s a Cybersecurity Ventures statistic — what else can you tell us about that? FA: I look at everything five years down the road. I’m very concerned about cyber turning very black. Up until this point, it’s been a financial crime for the purpose of stealing data and money. Now we have the ability to shut someone’s pacemaker off. We can stop a vehicle on the interstate. The typical car has 240 computer components. We have to be limited to 35 feet now, but in the future could you do it from 50 miles or 500 miles or 5,000 miles away? So I see cyber turning towards something black, a terrorist tool, not just stealing data and money. CM: A lot of cybersecurity and technology geniuses — Steve Jobs, Steve Wozniak, Bill Gates — they started out as sort of non-malicious hackers themselves. So I wanted to draw a quick parallel to you and how you started out as a fraudster when you were in your youth, and that kind of experimental mindset. Do you think that an experimental mindset can benefit us when we are fighting cybercrime? FA: When I did the things I did between the ages of 16 and 21, some 50 years ago, I was a runaway from a broken home and ended up on the streets of New York City. I did what I did to survive. And then when people started chasing me, it became a kind of game. I was aware sooner or later I would be caught and eventually I was caught. I then went to work for the FBI. I think that obviously if I hadn’t had those experiences that I went through, I wouldn’t be the asset that I am to the bureau. CM: Another hot topic right now is cryptocurrency. Cybersecurity Ventures predicts that in the next few years, 70 percent of cryptocurrency transactions will be for malicious activities or fraud. What are your opinions on crypto? FA: Well, I was asked about three or four years ago by Atlantic Magazine about what I thought about cryptocurrency and I basically said I thought it was one of the biggest scams to be perpetrated around the world. And we have so many exchanges now that obviously are fraudulent. They are easy to hack into — there is no way to know where your money went or get your money back, no way to recover your money. There is a high return in the investment so people get interested in doing it and in taking the risk, but it makes it easier for criminals to move money around the world and to commit other crimes — financial crimes — because they now have a way to do it and hide the money, launder the money, and so forth. So, I don’t know if it will be a lasting thing. Go here to read all of my blogs and articles covering cybersecurity. Go here to send me story tips, feedback, and suggestions.